Newswire for the unwired world. « Nokia unveils three fashion phones. RIM announces EDGE-enabled BlackBerry 8700c based on Intel CPU exclusively on Cingular. Research In Motion today announced its first BlackBerry device that runs on Intel XScale processor. 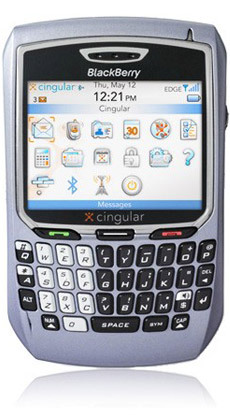 BlackBerry 8700c will be available initially exclusively on Cingular Wireless network starting on November 21st. The device is the first BlackBerry with quad-band GSM and EDGE class 10 Internet access and color QVGA screen. Price is said to be $299 with a two year service agreement. This entry was posted on Tuesday, November 1st, 2005 at 4:51 pm	and is filed under Cingular, Research In Motion. You can follow any responses to this entry through the RSS 2.0 feed. Both comments and pings are currently closed.